Out of a total of 75 world-wide security company’s entered in the categories of Technology & Products and Cyber Security/Economic Security, the 12-strong panel of independent judges selected 360 Vision’s Predator Radar camera for a prestigious Bronze Award, for innovation in the category of Technology & Products. Under the leadership of a member of the Board of the Federal Association of Independent German Consultants and Engineers, the final 13 award submissions were evaluated according to their innovation content, user benefits, economic viability and reliability. Perfect for a wide range of electronic surveillance applications, Predator Radar scans 360 degrees once every second to detect and track multiple objects simultaneously (with 400m of coverage)- providing a highly effective surveillance camera solution for wide area security monitoring and intruder detection. The official presentation of the Security Innovation Awards 2018 was held at Security Essen on September 25, 2018. 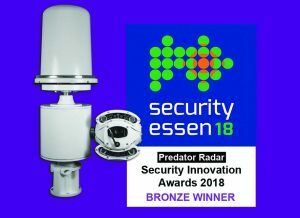 Visitors to Security Essen can see 360 Vision Technology’s award-winning Predator Radar and range of analogue, digital and Thermal surveillance camerasat stand number 5E08, in Hall 5.